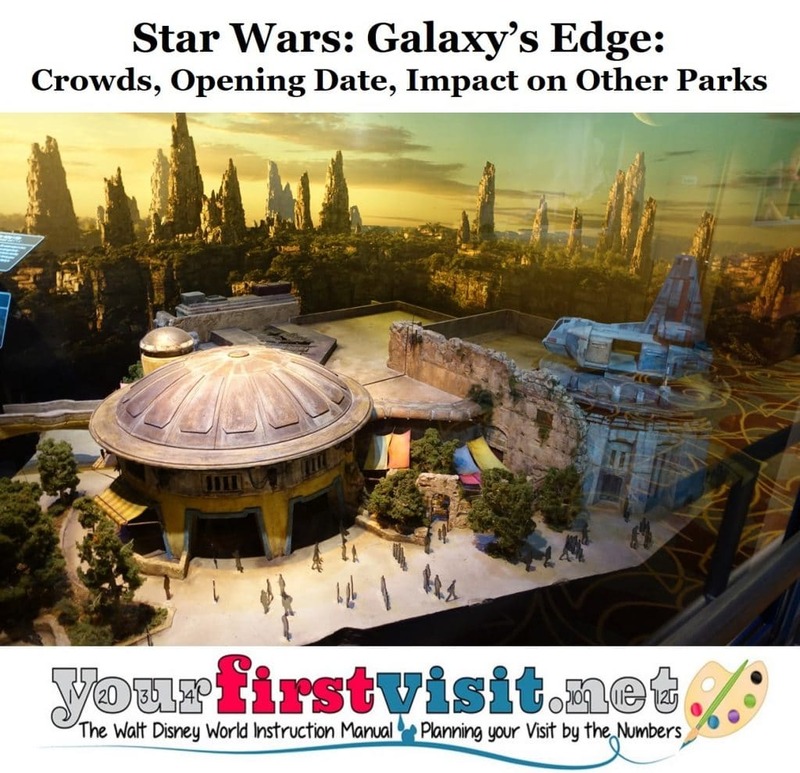 Star Wars: Galaxy’s Edge Forecasts: Crowd Levels, Impact on Other Disney World Parks, Opening Date, etc. Note: on March 7, Disney announced that Galaxy’s Edge will partially open on August 29, 2019. What will it be like in the new land itself? What will it be like in the rest of Disney’s Hollywood Studios? What impact will the opening have on the rest of the Disney World parks? When will it actually open? To some, the answer to the first three questions will be “horrible,” and to the fourth “August 29th, sorta.” But by looking at roughly analogous openings, you can develop a more nuanced set of forecasts. What’s new since then is a better sense of the astonishing impact of Pandora on Disney’s Animal Kingdom. So here’s my current forecast for Galaxy’s Edge. 1. WHAT WILL IT BE LIKE IN STAR WARS: GALAXY’S EDGE? This is the easy one to forecast. Galaxy’s Edge itself will be crushed with those interested in the Star Wars setting and its Millennium Falcon and battle rides for quite some time. I expect longer hours, daily Extra Magic Hours, and the use of FastPass+ or some other mechanism to restrict access to the actual land, not just the rides, but there will still be more demand to visit the land than capacity to serve it. 2. WHAT IMPACT WILL STAR WARS: GALAXY’S EDGE HAVE ON THE REST OF DISNEY’S HOLLYWOOD STUDIOS? Here I need to revise my September 2017 forecast a bit. I now expect the other “adult” rides in the park (e.g. Tower of Terror, Rock ‘n’ Roller Coaster, Star Tours) to see longer waits than I had initially thought. Visitors avoiding both the thrill rides and the new Star Wars rides should be OK, but everyone else will see substantially increased waits at the Studios. Based on what has happened at Pandora, I now expect an annualized growth in attendance at the Studios after Star Wars opens of on the order of at least 4 million more visitors, bringing the park to (after what I expect to be the impacts of Toy Story Land and Mickey and Minnie’s Runaway Railway, another million visitors*) to an annualized run rate of about 15.5 million visitors, or almost 50% more than it saw in 2017. So I am forecasting for Star Wars: Galaxy’s Edge basically an opening near the scale of the Animal Kingdom’s opening, but divided across the two North American parks. 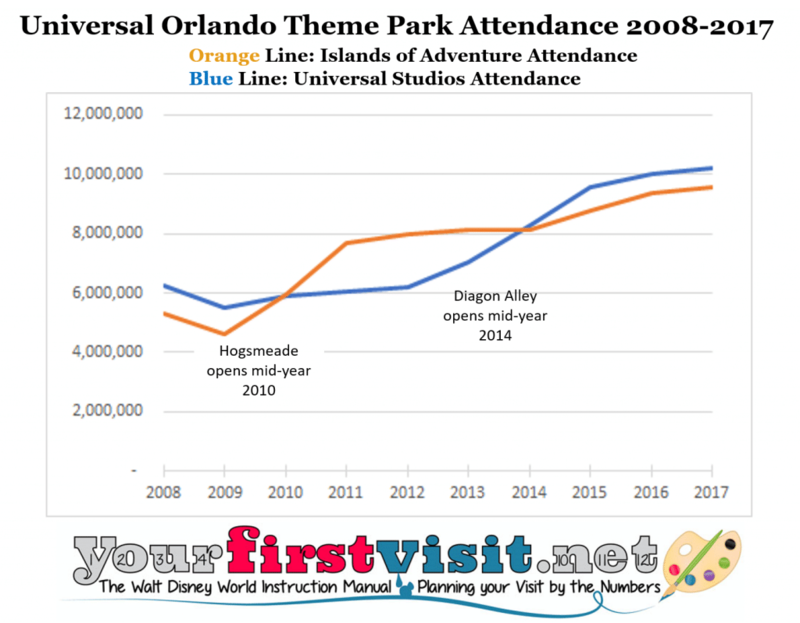 This makes the opening of Star Wars at Hollywood Studios almost a 50% larger opening than Pandora, and 60% larger than the average opening of the Harry Potter parks. Star Wars itself is a much more popular property than Pandora, and it will offer two world-class rides, rather than Pandora’s one world class ride and one also-ran. On the other hand, Disney World Galaxy’s Edge attendance will be diminished by first the fact than an equivalent land will open earlier in California, drawing off some potential attendance, and second by the horror stories I expect to come out of Disneyland, leading some to defer attendance until later years. Hollywood Studios park hours can fairly easily be expanded to the 14.5 hours/day we see this summer at Animal Kingdom, or more. Assuming its shows can have the number of times they are offered increased proportionality, this can add depending on the time of year 20-30% to its capacity, absorbing a couple million of the new visitors. At that level of operating hours, the five new rides that will open at Hollywood Studios between now and then (the two Toy Story rides, the Mickey and Minnie ride, and the two Star Wars rides) will open additional capacity of about 100,000 individual rides a day. On average this equates to either 2+ rides for all 15.5 million visitors or about 7 rides per day for each of the 5 million new visitors. So on the math, the park can take this level of increased attendance. The problem will be mismatches between supply and demand at individual attractions—especially at the two Star Wars attractions. I get about enough capacity for every visitor to the park to see just one of the Star Wars rides on an average day. If more than half of park visitors want to see both of them, lines will skyrocket, and some of the Star-Wars aimed folks will balk at waits for those rides and go elsewhere in the park. And since I expect a fair proportion of the dedicated Star Wars visitors to not be interested in equal measure in the new capacity at the Toy Story Land rides or Mickey and Minnie’s Runaway Railway, the result will be heavy lines at the rides most popular for adults—Rock ‘n’ Roller Coaster, Tower of Terror, and Star Tours. 3. WHAT IMPACT WILL STAR WARS: GALAXY’S EDGE HAVE ON THE REST OF THE PARKS? Everyone seems to think that the opening of a major land (or ride) has immediate spillover effects on the other parks. That simply has not been the case for Florida parks. So my forecast for the impact of the Star Wars: Galaxy’s Edge open on the rest of the parks: Very little, based on the historical record. 4. WHEN WILL STAR WARS: GALAXY’S EDGE ACTUALLY OPEN? And the ambiguity is likely intentional, as it gives Disney some scope to be late in its plans. I would expect the Disney World version to open at least 120 days after the Disney Land version opens—to give Disney World time to learn from operating patterns in California well before it opens up FastPass+, which, given Annual Pass Calendars for Disneyland in June 2019 suggests no earlier than mid-October 2019. By some of the four possible definitions of fall, that is also more than halfway through fall, so it suits the “late fall” concept. Mid-October is largely past the Columbus Day-focused fall break season at Disney World, and begins a period of two months when only one week—Thanksgiving week—sees really heavy crowds. While Disney has shown willingness to open rides during high crowd periods (Seven Dwarfs Mine Train and Pandora both opened over Memorial Day weekend, a period more crowded than any between October 15 and December 15 except Thanksgiving week), it is operationally simpler to avoid such periods for opening. Winter begins, depending on which definition you are using, during the period from early November through December 22, 2019. Given the value of some lower-crowd operating time, I’d think the latest thoughtfully projectable date for opening would be soon after Thanksgiving 2019, so that for now creates an opening period of mid-October to late November, but not likely Thanksgiving week itself. Note that Kelly can help you book your DIsney World trip-either aiming at Star Wars: Galaxy’s Edge, or aiming to avoid it. Use the form below to contact her. *I get the increment from Toy Story Land and Mickey and Minnie’s’ Runaway Railway by comparing them to the openings of New Fantasyland and Seven Dwarfs Mine Train, each showing an increment of about a million visitors, and then dividing by two for the Studios being a less intrinsically attractive park than Magic Kingdom. **Annualized rates are calculated by taking first year increases, dividing by the number of open days, and then multiplying by 365. All data is from TEA . 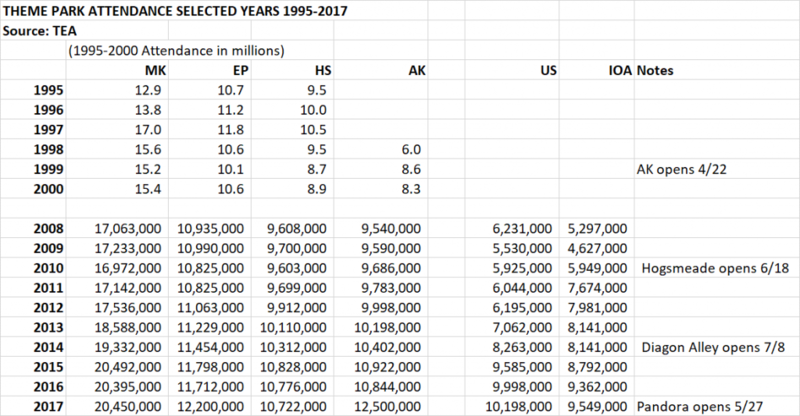 The numbers are above, and an excel version of them is here. Any thoughts on when Mickey’s Runaway Railway will open? Alicea, there’s no great info out about the Railway. Forecasts I’ve seen say “fall 2019.” I would not be surprised to see it open earlier. 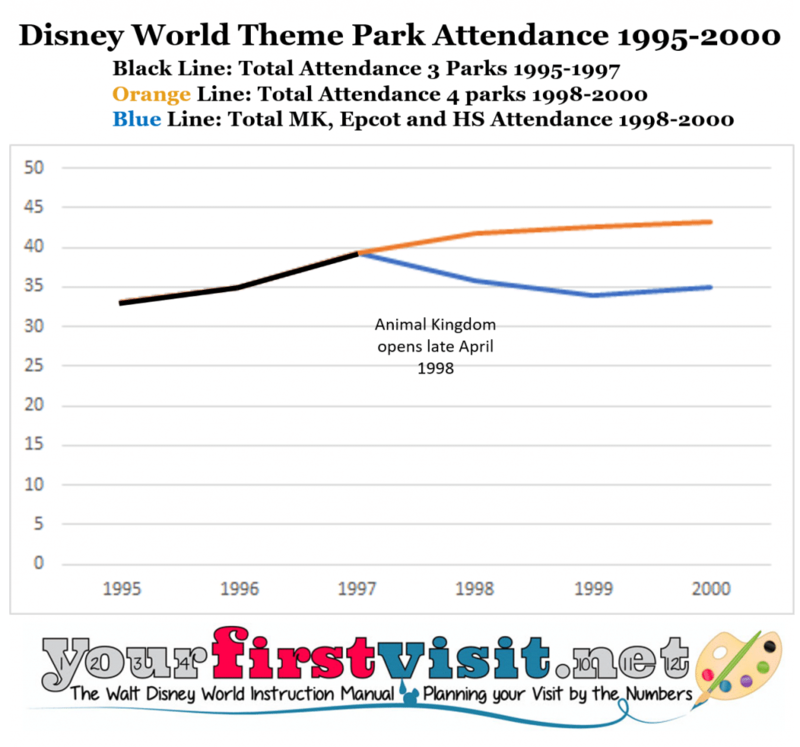 This is really interesting, particularly the potential impact on the other parks. Thanks for your hard work. We’re tentively planning the week after thanksgiving in 2019…. so as long as we avoid Hollywood Stuidos we should fine? Yup, Becca, that’s my current forecast. I think you’re right about the nightmare about to be unleashed on the West coast next summer. Any guesses as to why Disney decided to execute this such that Disneyland will see it’s version opening first? And at the height of summer? It just seems like a terrible decision. I would think construction would actually be easier for them at HS. And the economics make more sense. Ryan, nobody knows for sure. There’s some thoughtful speculation here, but in the comments some equally thoughtful pushback. We’re planning a trip for January of 2020 to Orlando, are we insane for going so soon after the opening of Galaxy’s Edge? So Lyn, here is my somewhat unhelpful answer: if enough folks stay away for exactly the concern you describe, then the parks–other than HS, and in particular the Star wars area and the other more grown-up rides like Tower of Terror and Rock ‘n’ Roller–will be just fine. So you have to decide if you are willing to take the risk that other folks will stay away! We are debating between late September or mid November for a 2019 trip. We’d prefer to avoid Star Wars, so that would lean toward September, but we’d also prefer the November weather. I’m holding out for better info as to opening, but at some point we may just need to roll the dice with the November dates. Max, there is no legal meaning to “late fall.” I would expect that September will almost certainly avoid Star Wars, but November maybe not. If you still aren’t sure, I would go ahead and book the Nov 2019 dates (I’m more than happy to help with that. Feel Free to contact me at 980-429-4499 or kellyb@destinationsinflorida.com). November dates book up faster. You can make changes to any reservation, up to 30 days before travel at no charge. You can wait until closer to decide for sure. (But I do suggest locking in a date no later than March – to be sure to be able to book your dining at the 180 mark). Hey Max – I\’m Kelly, Dave’s dedicated Travel Agent. You should be safe with a November Vacation. Disney’s “Late Fall” opening for Star Wars Land could mean a late opening all the way till the December. (12/20/2019 – Last Day of Fall. 12/20/2019 – Last Star Wars movie release date. Things that make you go hmmmm). I suggest booking a November vacation (I would love to help you plan your vacation, feel free to contact me at kellyb@destinationsinflorida.com) if that’s your preferred time (those dates fill up quicker). Then keep your eye out for when SWL will open. You can make changes to your Disney reservation up to 30 days before arrival at no charge. Just decide for sure by March (so you can book September dining reservations at the 180 day mark). Thanks Jane. I think that if in doubt, go earlier… My guess, BTW–haven’t talked with Steve about this–is that the salute will be renewed, but not for all of 2019. Any update on Star Wars openings? We are looking at a Nov 15-20 2019 trip, will crowds be crazy then or would Feb 2020 be a better option? Amy, there’s no word. February depends a bit on when you are thinking of going–see this. Eager to see your take on things now that they announced the Aug 29 date. I’m nervous b/c we’ve got Thanksgiving week and it’s the first big holiday week (I think….) after it opens, but it’s the only time we can go……and we can’t completely avoid HS for other reasons. Question: we don’t usually do the rope drop, do we need to do that so that HS won’t reach capacity before we get there? We typically get there by 9 or 10 am b/c we travel with an older relatives who don’t do early mornings. Am thinking of a weekday early in Thanksgiving week before the huge T crowd hits. Hi Jane, I am developing my thoughts and will post them likely on Sunday. It depends a bit on whether or not the second ride is open by then, and how morning EMH patterns are working–for example, as I note in the link, they may be offered every day. The good news–if there is good news–is that we will have info on park closes well before your arrival. Query–what hotel are you in? I had made reservations for myself and my 3 older children for September 10-17 thinking the crowds would be low and Galaxys Edge would not yet be open. Surprise!!!! Hoping that the crowds will be tolerable and am actually excited to be able to see it.